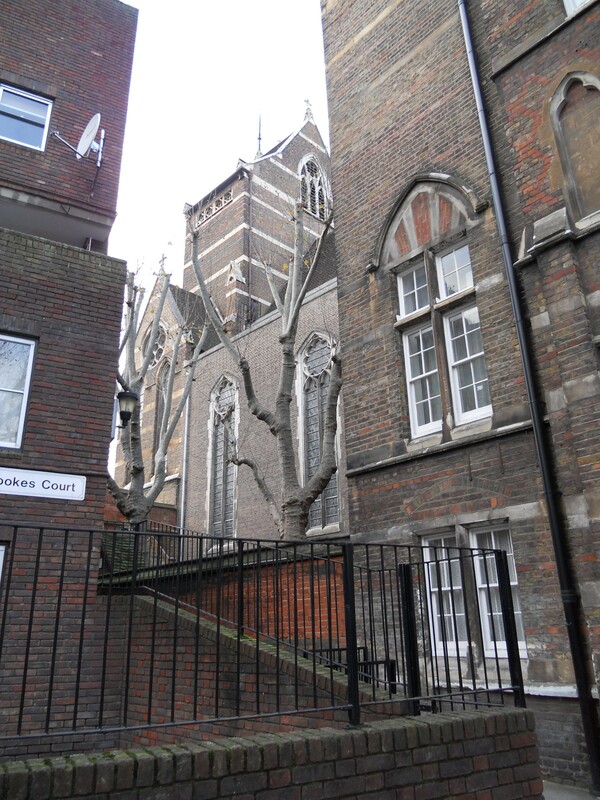 This is a famous church – an Anglo Catholic shrine hidden behind the Prudential headquarters. It is not easy to get a good picture of the exterior but there is one here – the best I could do. 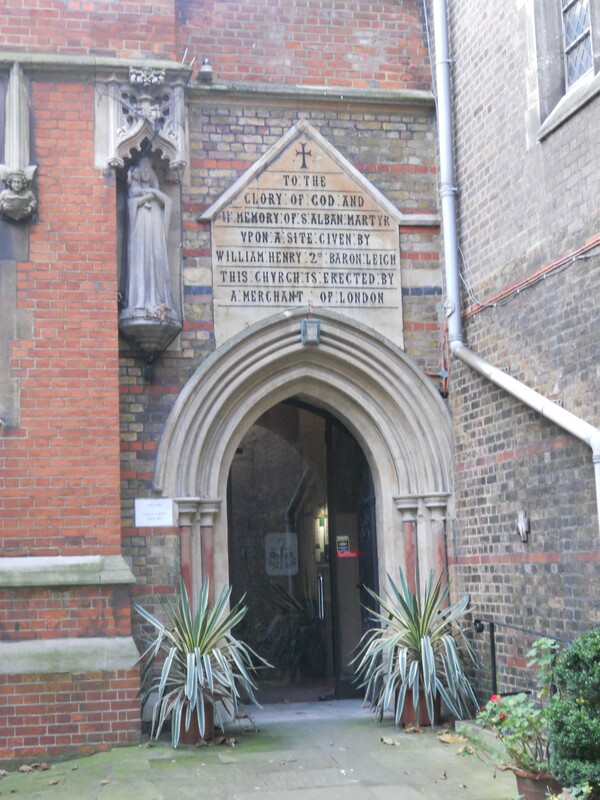 The entrance to the church is through a gateway. The notice board proudly tells all comers that the church is open every day. Opposite the entrance is a wonderful sculpture – ‘Jesus raised from the Dead’ by Hans Feibusch and was installed in 1985. There is a small enclosed garden which is itself a quiet haven from the rush of the world around. Inside the church proper, there is a dimly lit chapel on the right hand side – the Mackonochie Chapel which contains the effigy of Fr Alexander Mackonochie who was the first vicar here who promoted the Catholic strand of the Anglican Church. This was unfortunately locked. On the other side a door opens into the church itself. 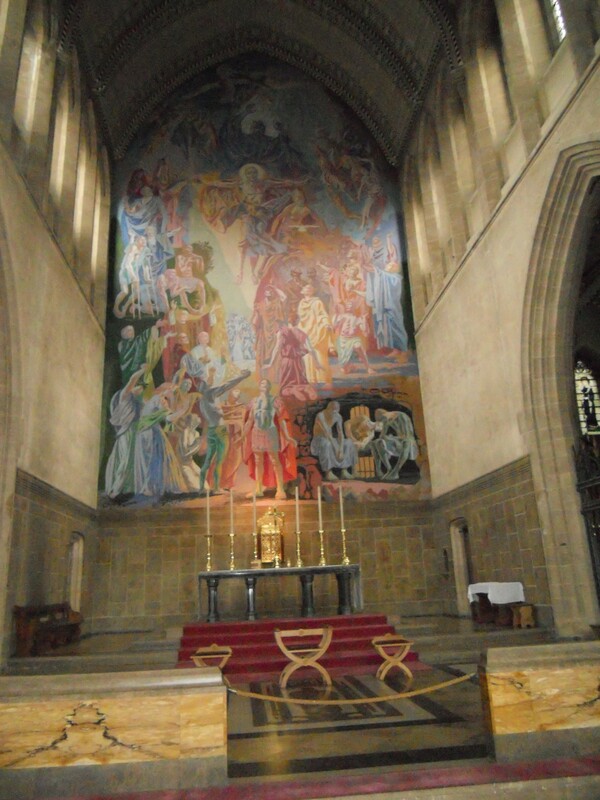 The interior is stunning as the East end is dominated by a 60 foot high mural, ‘Trinity in Glory’ by Hans Feibusch again. It is wonderful and repays careful study. There is an atmosphere of peace and prayerful silence here. The church seems far removed from the bustle of the great city that surrounds it. Several visitors came in whilst I was there and all of them sat quietly on this magnificent place. There is no visitors book but there is a free colour leaflet ‘A Walk Around S. Alban the Martyr Holborn’ which is well done. Also there is a welcome ‘Information Brochure’. There are several votive stands to use here but no where to leave prayer requests. The church also features several confessionals. There is a small children’s area to use with toys and books. The church website is at http://www.stalbansholborn.org but this gives no visitor information. St. Alban’s is a church well worth visiting. Apparently the music here is the best of any church in London. I rate it is OK + for this study. Somewhere to leave prayer requests and a bit more thought into ministering to visitors would make this ‘very good’. St. Alban’s is a church well worth seeking out.